To commemorate Record Store Day’s vinyl centric “Back to Black Friday” event, Experience Hendrix, L.L.C. in conjunction with Sony Music’s Legacy Recordings, is releasing Morning Symphony Ideas, a set of rare Jimi Hendrix studio recordings under the Dagger Records imprint. Dagger Records was started by Experience Hendrix in 1998 as an official ‘bootleg’ label whose releases would provide Hendrix fans throughout the world with additional live performances, home demos and studio recordings not issued on commercial albums. This 10” translucent yellow vinyl E.P. consists of three tracks recorded between September and December of 1969, at a time when Hendrix was starting to put together his Band Of Gypsys with bassist Billy Cox (who appears on the track “Strato Strut”) and drummer Buddy Miles (who appears on all tracks). This Morning Symphony Ideas vinyl release is the next vinyl Dagger release for Record Store Day, following in the footsteps of Hear My Music, Burning Desire and Live At Clark University, all of which have been extremely popular. By 1969, international success and the dizzying schedule of touring and performing it required wrecked havoc with Jimi’s desire to create new music. However, with fellow musicians Cox and Miles, who also came up in the same R&B “chitlin’ circuit,” he began writing music that leaned more towards the funky end of the spectrum than his previous work with the Jimi Hendrix Experience. Morning Symphony Ideas reveals the earliest stages of Jimi’s songwriting technique from that period. With a nod to the guitar styling of Curtis Mayfield, “Jungle” gathers together strands of “Ezy Ryder” and Villanova Junction,” the haunting theme he had successfully premiered at Woodstock in August 1969. On the track, Jimi is head singing the melody of “Freedom,” describing to Miles yet another new song he wished to explore. The idea of “Room Full Of Mirrors” dates back to the 1968 recording sessions for Electric Ladyland. On this 1969 recording, Jimi begins anew, modifying the song’s tempo and even throwing in a short burst of “Message To Love” for good measure. On “Strato Strut,” Jimi pays homage to Jimmy Nolen of James Brown’s band, an iconic R&B guitar master. Keenly aware of the demo’s promise, Jimi instructs engineer Bob Cotto to “save that” at the song’s conclusion. Morning Symphony Ideas offers a glimpse into Jimi Hendrix’s rigorous songwriting process. His compositions would evolve over time through repeated reworking, usually starting with a basic rhythm pattern unto which he injected new ideas as he pleased. This vinyl package is limited to 5,000 numbered copies, and will only be available at brick-and-mortar record stores on Black Friday. 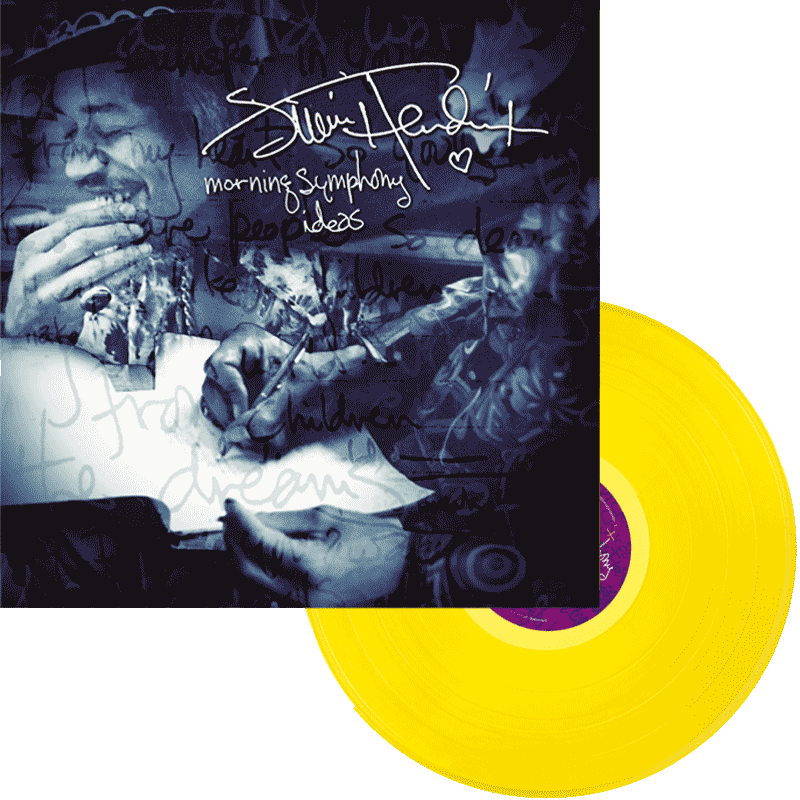 The full length CD/digital version of Morning Symphony Ideas (released in 2000), which includes three recordings not featured on this 10” yellow vinyl EP, is available at http://jimihendrix.com. Compilation produced by Janie Hendrix, Eddie Kramer & John McDermott for Experience Hendrix, L.L.C. Founded by James ‘Al’ Hendrix, Jimi’s father, in 1995, Experience Hendrix, has been managed since its inception by the family members handpicked by Al during his tenure as Chairman. It is the official family company charged with managing the music, name, image and likeness of Jimi Hendrix. As a part of their daily operations, Experience Hendrix and Authentic Hendrix oversee Jimi’s timeless legacy on a worldwide basis.